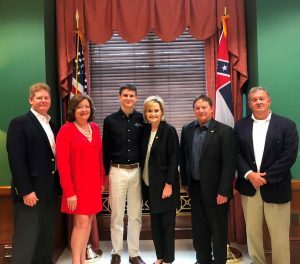 Pictured left to right: Beau Gex, Hancock County Port & Harbor Commission; Tish Williams, Executive Director of Partners and the Hancock Chamber; Grant Johnson, an engineering student at MSU; Congressman Trent Kelly (R-MS-1st District); and, Guy Johnson, Vice Chairman, Partners with Coast Electric. Pictured left to right: Michael McDaniel, Chairman of Partners for Stennis & Michoud with Aerojet Rocketdyne; Tish Williams, Executive Director of Partners and the Hancock Chamber; Congressman Gregg Harper (R-MS-3rd District); Grant Johnson, an engineering student at MSU; and, Guy Johnson, Vice Chairman of Partners with Coast Electric. 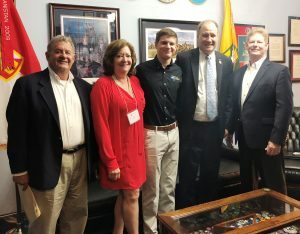 Pictured left to right are: Matthew Stanbro, PhD physics candidate at the University of Alabama; Bill Randolph, President of Syncom Space Services; Congressman Ralph Abraham (R-LA-5th District); and, Laura Haas of Laura Haas Consulting. 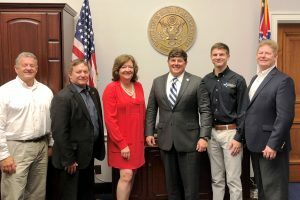 Pictured left to right: Beau Gex, Hancock County Port & Harbor Commission; Michael McDaniel, Chairman of Partners for Stennis & Michoud with Aerojet Rocketdyne; Tish Williams, Executive Director of Partners and the Hancock Chamber; Congressman Steven Palazzo (R-MS-4th District); Grant Johnson, an engineering student at MSU; and, Guy Johnson, Vice Chairman of Partners with Coast Electric. 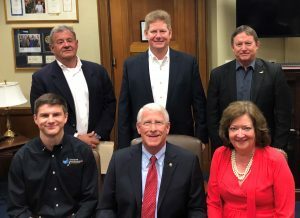 Pictured left to right, first row: Grant Johnson, an engineering student at MSU; Senator Roger Wicker (R-MS); Tish Williams, Executive Director of Partners and the Hancock Chamber. Second row left to right: Beau Gex, Hancock County Port & Harbor Commission; Guy Johnson,Vice-Chairman of Partners with Coast Electric; and, Michael McDaniel, Chairman of Partners with Aerojet Rocketdyne. Pictured left to right: Guy Johnson, Vice Chairman, Partners for Stennis & Michoud with Coast Electric; Tish Williams, Executive Director of Partners and the Hancock Chamber; Grant Johnson, an engineering student at MSU; U. S. Senator Cindy Hyde Smith (R-MS); Michael McDaniel, Chairman of Partners with Aerojet Rocketdyne; and, Beau Gex, Hancock County Port & Harbor Commission. Members of Partners for Stennis & Michoud participated in the 27th annual Citizens for Space Exploration Trip to DC May 15-17, 2018. The goal was to meet with members of Congress and their staff from Mississippi and Louisiana as part of a National Coalition. Members of Partners were part of close to 100 travelers, representing 26 states, who conducted over 400 Congressional office visits. The diverse group of travelers included elected officials, industry representatives, community leaders, and 35 students studying engineering or related technical fields. The students with the Mississippi / Louisiana Team were Grant Johnson, a sophomore at Mississippi State University studying Aeronautics Engineering and Matthew Stanbro, a PhD candidate in physics at the University of Alabama. While the main purpose of the visits was to advance support for human space exploration, the Partners team did address other issues of interest at Stennis Space Center and Michoud Assembly Facility such as continuing the extension of Enhanced Use Lease Authority, increasing rocket manufacturing and testing opportunities, and the expansion of Navy operations through Gulf of Mexico Unmanned Systems and the new certification program at the University of Southern Mississippi for glider pilots and unmanned systems at Stennis. 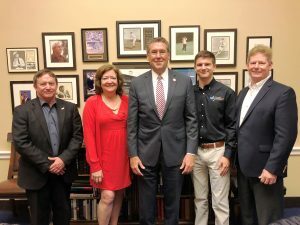 Michael McDaniel of Aerojet Rocketdyne who chairs Partners said the team saw continued strong bipartisan support for NASA human space exploration programs and Navy operations from the Mississippi and Louisiana delegation. 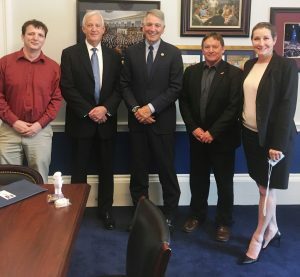 “These visits are important to foster a greater understanding of NASA’s space exploration programs and insure support for Mars as the ultimate destination with the Moon as our stepping stone,” said McDaniel. The Partners team applauded sustained policy and budget support from Congress and the President for American leadership in space exploration. The group advocates for full funding of space exploration programs as set forth in the 2017 NASA Authorization Act; ISS extension beyond 2024 based on capabilities; utilizing commercial crews to service the ISS within the next year. They also believe that Orion / SLS are critical capabilities to enable human exploration beyond low-earth orbit; and, advocate for an incremental, American-led approach to sending crews on deep space exploration missions as soon as possible. Bill Randolph, President of Syncom Space Services was part of the Partners DC team. He oversees the SACOM (Synergy Achieving Consolidated Operations and Maintenance) program and also provided an up-date on how this contract is reducing costs and increasing benefits to NASA facilities and the Space Program in general. For a complete report, join Partners for Stennis & Michoud at the next Quarterly Meeting at Northshore Technical Community College – STEM Campus in Lacombe, LA. During this meeting, interested stakeholders will meet face to face with workforce professionals from the two state area to learn about the workforce resources available to business and industry to work toward pathways to build a strong and skilled workforce. The meeting starts at 3pm. To attend, contact 228-467-9048 or go to www.partnersforstennis.org.